It uses five typologies to suggest the wide variety of ways in which artists use drawing as an artistic strategy. By doing so, it not only presents thirty radical positions within the field of drawing as practised in the Netherlands, but also reveals what makes drawing such an extraordinary and attractive discipline. One set of artists whose work is shown in the exhibition use drawing as a means of inquiry. Their ‘mind maps’, sketches or other kinds of propositions are generally not an end in themselves, but rather the end-result of explorations whose scope is broader than art per se. Another set are concerned with time and memory. 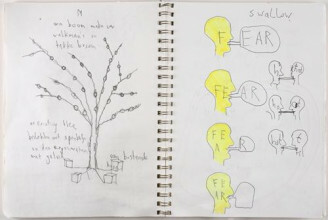 Their drawings encapsulate time and events. A third substantial group are story-tellers. They depict surreal universes and construct neo-romantic landscapes. Then there is a group who use drawings to address issues of identity and representation. And, finally, the fifth group are concerned with the formal aspects and process of drawing: with drawing as an activity, with lines and planes, and with the material and support. Over recent decades, drawing – unlike painting – has constantly been declared alive and well. This exhibition demonstrates the relevance of the medium to many artists, including those who normally work in other media. Many of the artists in it are primarily active in other artistic disciplines but make excursions into the field of drawing. The extraordinary cross-fertilisation that results has expanded the definition of drawing to include forms previously inconceivable. For this reason, Drawing Typologies includes not just works on paper, but also installations, murals, videos and examples of sound art in which notions of drawing play a significant part. Several artists are creating site-specific installations for the exhibition and the majority of the participants are producing new work. The jury, composed of Hugues Boekraad, Suzanna Heman, Arnold Mosselman, Marijke van Warmerdam and Roel Arkesteijn (chairman), have examined the 450 submissions and selected the following artists: Eylem Aladogan, David Bade, Semâ Bekirovic, Justin Bennett, Maura Biava, Nathalie Bruys, Ronald Cornelissen, Iris van Dongen, Marcel van Eeden, Ivan Grubanov, Voebe de Gruyter, Ni Haifeng, David Haines, Rosemin Hendriks, Job Koelewijn, Frank Koolen, Marijn van Kreij, Marc Nagtzaam, Erik Odijk, Marco Pando, Amalia Pica, Daragh Reeves, Daniel Roth, Etta Säfve, Charlotte Schleiffert, Joseph Semah, Aam Solleveld, Lily van der Stokker, Aji V.N. and Ina van Zyl. The exhibition is being organised by guest curator Roel Arkesteijn. It will be accompanied by a publication authored by him and designed by Luna Maurer (publisher: Stedelijk Museum Amsterdam; price: approx. € 15). The event is partially funded by the Municipality of Amsterdam.